When I was at the Olympic Curling Trials in Broomfield, Colorado a few weeks ago, I met an interesting guy named Jay. Jay just happens to be the owner and founder of Beer Clothing Company . He has some very unique products like this Miller High Life hat with a built in bottle opener on the brim. You gotta love a combination hat - bottle opener. The up shot of this story is that I bought a hat and forgot it on the table in his sales booth. Two weeks later, I still hadn´t called so I looked him up on the web and gave them a call. Not only did he remember me, he shipped it to me for free. Wow. Thank you Jay. Check out the flagship product of Beer Clothing Company, the Beer Buckle. Now there is a belt buckle that also holds your beer. Think of it, you can open your beer with your hat and hold it in your belt buckle. What could be better than that? President Barack "Mr. Goodwrench" Obama at your service. Apparently, you and I are now providing warranties on GM and Chrysler cars and trucks. I have one thing to say, give me a stinkin break! Oh, and how exactly did this whole decision to fire the CEO of GM, Rick Wagoner, come about. Now our president is firing the heads of companies? And isn't one reaction to think, "well, if Rick Wagoner deserves to go, let's get rid of those Wall Street creeps who put us into this tailspin". Warning, that thinking is a trap! Under no circumstances do we want any branch of our government dictating who our private sector hires. Just think of how quickly out of control this could get. It would be just like the slippery slope of bailouts we are currently sliding on. Many of these Wall Street guys disgust me, but that is no reason for the federal government to begin a command and control economic policy. I have absolutely no reason to believe that the government will pick corporate leaders better than the private sector. Seriously, are you kidding me? The bottom line for me is that everyday that goes by without Ford taking bailout money makes me want to buy a new Ford. Go Ford go! The free market needs you to succeed. If you are curious enough to open the link below, I cannot take responsibility for any type of impulsive vomiting reaction. Sometimes when things are seen or compared in close proximity, it sheds a whole new light on them. Please view this link of Hillary Clinton with care. Major internet news and entertainment outlets announced yesterday that Donald Trump had left a $10,000 tip for a waiter at a resturant in Santa Monica, California. It turns out that there was even a copy of the reciept as shown below. I have to admit it is kind of fun to look at. It sort of gets my imagination going just imagining what it would be like to 1. have enough money to give a crazy tip like $10,000 and 2. thinking about the reaction that a server might have to such largese. 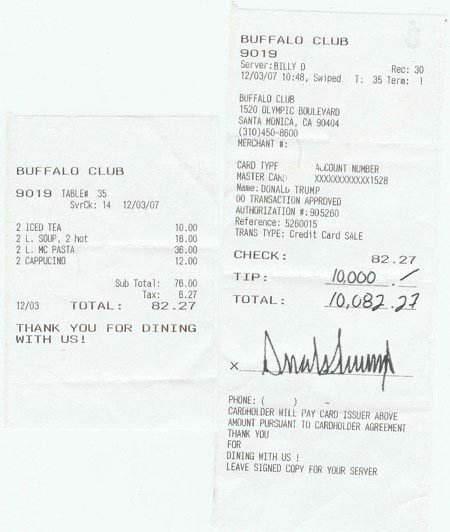 Kinda cool.
. A couple days ago Donald Trump came in and left him a $10,000 tip! Wow! 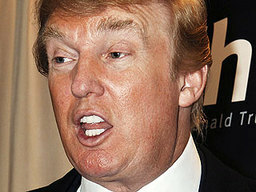 My friends think he's just trying to promote his celebrity Apprentice but whatever. Billy told me Donald hardly even talked to him until the end when he asked, "What's the biggest tip you ever got?" I guess Jerry Bruckheimer (sp?) comes in a lot and once tipped him $500 on a $1000 tab and Bill told him. Trump just wanted to show he's got the biggest _____!" In today's world every incredible almost to good to believe story has the same ending though doesn't it? And that ending is, the news agency's didn't really work too hard to check their facts. They saw a good story and quick put it on line so they could beat everyone else to the punch, thereby drawing more web hits and pumping up their advertising dollars by providing more click throughs to their paying customers. In other words, the whole things was another hoax. And this was particularly interesting to me on at least two fronts. One is that it was such an easy scam to pull over on the media because it took no money and almost no time to put this story together and two, the media outlets could have so easily checked their facts that it is laughable. Oh those pesky facts. For me the moral to the story is this: READER BEWARE! And don't think for two seconds that this only happens in "entertainment" type news items. This is going on every single day. One example of this same thing going on right now is what is happening with our men and women risking their lives in Iraq. The morning guys on KSTP Radio 1500 announced this week that although many people are focused on our border with Mexico, there are a whole lot of "illegal Europeans" that nobody is paying attention to. And yes, I must say, they were serious. Thanks for sharing guys....I will be on the alert for illegal Europeans from here on out. Here is the actual job posting: "We seek a newspaper journalist based in India to report on the city government and the political scene in Pasadena, California, USA." I'm sure no American would actually want this job, right? I mean, reporting should have been outsourced long ago. What they should actually do in Pasadena is find an illegal alien that is local. It would be cheap labor and they could keep their eye on him a little easier. At least I understand California logic now: we in-source to illegal aliens and outsource to India. Do we even need workers in America? Six Islamo fascists cooked up a scheme to try and shoot up as many military men and women at Fort Dix as possible. I actually found this interesting for a couple of reasons. 1. They chose a military target. That strikes me as unusual based on past behavior and their love for killing civilians. 2. Three of them were illegal aliens. Does George Bush let these guys in on purpose to build support for the war on terrorism? If so, it could hurt his quest for an amnesty program. Oh, but that would be thinking ahead and involves logic.